This isn't finished yet, but Tessie insisted on showing you what I have done so far. I got up this morning with the intention of doing all of the housework that I missed out on for the last four days....I got the kitchen floor mopped and a few other things cleaned up, but I didn't last all that long. I am still having twinges in my neck. I don't want to have the pain come back, so I used that as an excuse to quit. I have decided that, since this is Saturday and tomorrow's Sunday, I am going to pretend that the week is finished and just start over on Monday. Please notice that Tessie changed into a more colorful apron after reading yesterday's post. I am really happy that a lot of you agreed with me about the latest non color trend. Maybe the pendulum will start swinging back towards the more colorful now...I don't think that they can go any further this way, unless they make everything transparent. Have you noticed that the only prints they are using are one solid color mixed with white in geometric patterns?....That's another thing that is annoying me this year. 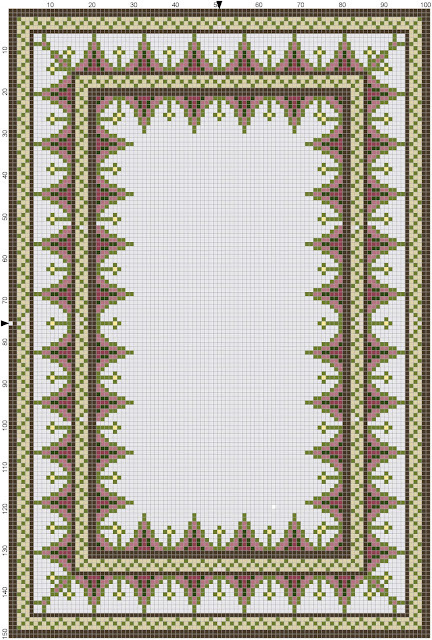 Since I am sitting the rest of the day out, I got out the old laptop and designed a rug to keep you busy. Pretty simple. I used two shades of green, two shades of mauve, light yellow, beige and Perle gray for the background. The solid borders are a mocha brown. As usual, it is an original design, not to be resold. Personal use only please. I am going to spend the rest of the afternoon working on a needlepoint caddy for my remotes. I have a very large one for the TV, that I have to use to get the Apple box turned on...A tiny little apple remote that I am always losing. I am going to try to combine the two in one case to keep them together. It seems like I waste a lot of time searching for the small one. Maybe this will solve the problem. I can't wait to see it finished, it is looking beautiful.